As a man working in early years for over 12 years, I continue to campaign to try and redress the gender imbalance in our workforce to ensure we are providing the widest range of opportunities and experiences possible through men and women working together to meet the needs of boys and girls. Many years of campaigning and advocacy have failed to improve the less than 2% male proportion, nationally. There is wide support for more men to enter the sector, from practitioners, parents and academics and the arguments for more men working to care for and teach our youngest children are compelling. The last 12 months has seen the development of a loose network of support groups across the country and renewed interest and initiatives from various organisations. As Early Years providers and practitioners, we understand the profound effect of the reciprocal relationship and interactions we have with our children; the responsibility for shaping development during their formative years and the joy and fulfilment of making a difference in their lives. I speak to many men working in Early Years who have powerful testimonials to just such experiences. Now, more than ever, we need committed individuals to help close the attainment gap for children from disadvantaged backgrounds. In this respect, almost 50% of the population is currently an untapped resource. We would love to see the United Kingdom lead the World in the gender balance of our Early Years workforce. 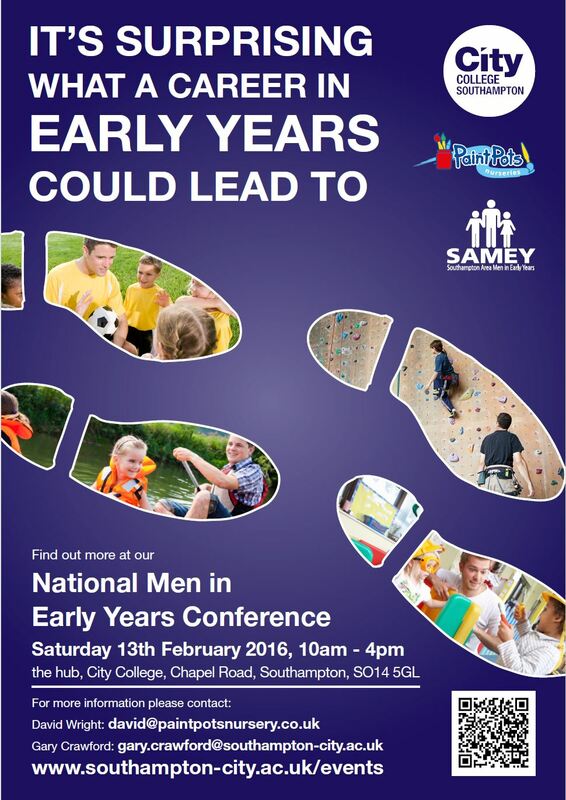 ‘Early Years, a Career for Everyone’, a UK national Men in Early Years conference, is to be held in Southampton, Saturday 13th February 2016. It will be a very positive, inspiring and purposeful day at which both a national network and a charter for Men in Early Years will be launched. Men and women are welcome.